Mount Rushmore, Grand Canyon, Hogwarts. On June 18, The Wizarding World of Harry Potter theme park will open in Universal Studios in Orlando, Florida with rides and attractions straight from the series that millions have fallen in love with. Harry Potter's Wizarding World in Orlando, Fla. 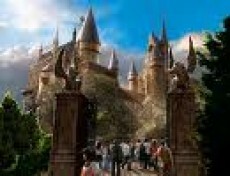 The park includes a realistic Hogwarts that takes guests on tours allowing them to view areas from scenes in the movies, a replica of the rustic shopping village, Hogsmeade, and a wild, two car racing rollercoaster called the Dragon Challenge. Harry Potter lovers all around the world– including at Penn Manor, are more than hyped for the unveiling. “Our field hockey tournament is in Florida next year, so I’m excited to see everything,” said Kayla Bixler. “I would want to go if it wasn’t so far away,” said Ryan Newswanger. Along the way throughout the park, attendees may also run into Hagrid’s hut that takes you on a smaller rollercoaster named The Flight of the Hippogriff. After experiencing all the rides, guests can even visit a replica of The Three Broomsticks restaurant where they can choose from foods such as butterbeer (a non alcoholic beverage from the books), fish and chips, peanut butter ice cream and more. Many travel sites offer generous travel packages, and universalorlando.com offers a one day pass to Universal Studios for as little as $109 for an adult. But if one day isn’t enough, the same site offers seven day passes for only $169.99 for an adult. Households with children ages 7-14 can also enter a scholastic contest for a family of four for an all travel expense paid trip to visit the park for 3 days at www.scholastic.com/realmagicsweepstakes. Whether a devoted fan, a movie lover, or just jumping on the band wagon, the theme park is sure to fulfill the dreams of anyone who ever wished to step into Hogwarts. I would choose Slytherin because I like the good guys. I never liked Gryffindor since they have mean characters like Snape and Malfoy. HARRY POTTER!! HARRY POTTER!! HARRY POTTER!! HARRY POTTER!! HARRY POTTER!! HARRY POTTER!! HARRY POTTER!! HARRY POTTER!! HARRY POTTER!! HARRY POTTER!! HARRY POTTER!! HARRY POTTER!! HARRY POTTER!! HARRY POTTER!! HARRY POTTER!! HARRY POTTER!! HARRY POTTER!! HARRY POTTER!! HARRY POTTER!! HARRY POTTER!! HARRY POTTER!! HARRY POTTER!! HARRY POTTER!! HARRY POTTER!! HARRY POTTER!! Big Daddy 404, Slytherin is the house that Snape is the head of and the house that Malfoy is part of. Gryffindor is the house Harry, Hermione, the Weasley Family, ect. are part of. Maybe you need to brush up on your Harry Potter. I am going there with my daughter in June. I think it looks like a really interesting theme park! Nice article, Mike and Lindsey!